During our roadtrip to Portland we stayed at the Hotel Pineapple Rose – a boutique hotel at 50 SW Morrision Street. It is part of Bellevue’s Pineapple Hospitality. 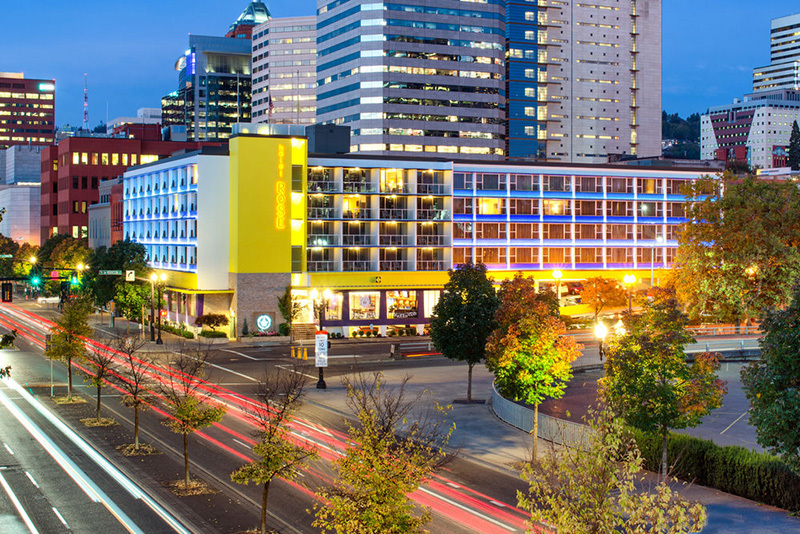 It acquired ownership of Hotel Fifty in downtown Portland. The 140 room hotel is renovated with a cute aesthetics featuring their signature pineapple logos and a plush husky. They are for sale for you to take home! The beds are comfortably firm for a restful night of sleep. Roomy bathrooms and steps away from the heart of downtown Portland is a huge win. 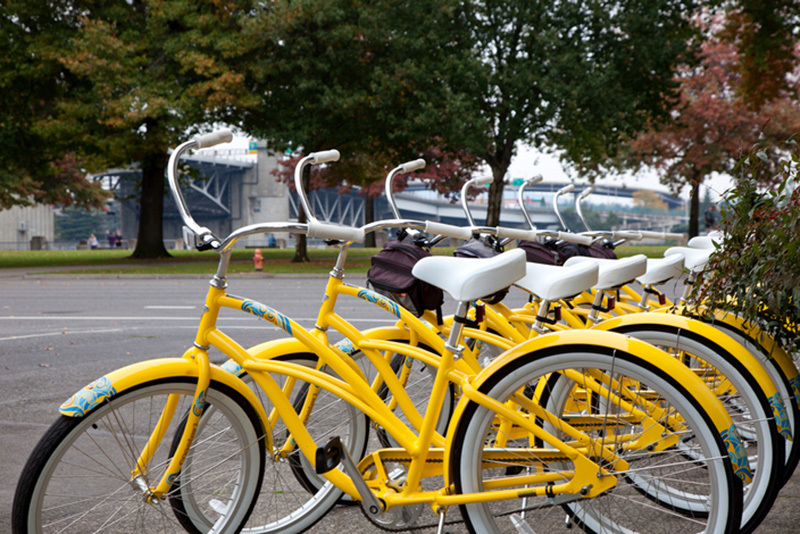 It is also located just across from Tom McCall Waterfront Park. Morning runs along the water and over the bridge was quite enjoyable. One thing about the showers however they do not have a physical door that shuts. So it is easy to flood the floors if you are having too much fun in the hot showers. Hotel Pineapple Rose offers the complimentary guest services and amenities like bicycle checkout program, hotel-wide WiFi internet access, free in room water bottles and coffee, pineapple cupcake at the guest service welcome desk. Daily parking rates average $20 USD. However, I liked how we were able walk to Nike Town, Nordstrom and enjoy a nice meal at Departure by Top Chef Greggory Gourdet. The leisurely stroll back to the hotel room was safe. 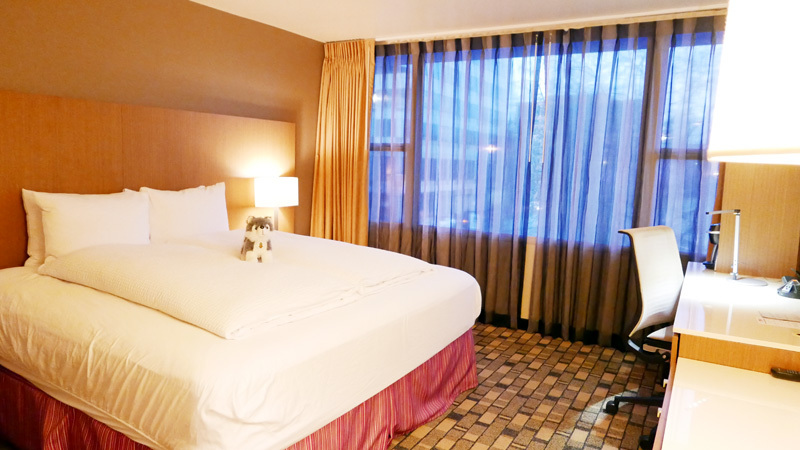 If you are looking for a reasonably priced hotel in downtown Portland, Hotel Pineapple Rose is a great option for around $200 USD per night. Plus it is near bridges, so you can easily access between North-West and North-East of Portland. Pineapple Hospitality Co. includes Hotel Five in downtown Seattle, the Maxwell Hotel in Seattle’s Queen Anne, Watertown Hotel and University Inn in the Seattle University District, and Hotel Rose in Portland. If you are visiting Portland here are 10 Things You Need To Know about Portland! Vancouver International Wine Festival is not one of those culinary events you can explore all in one day. This year between February 20 – 28, 2016 there are 155 Wineries and 14 Countries featuring Italia. Wine events includes International Festival Tastings, Wine Seminars, Wine Minglers, popular Vintners Brunch, and Winery Dinners liked Wines of Veneto & Sicily at Giovane Cafe at the Fairmont Pacific Rim Hotel. Winery dinners are the perfect way to experience wine pairing, the wine producers over a multi-course dinner. I’m so excited to be invited for an evening to learn and discuss the food pairings. $175 all-in (includes wine, dinner, taxes, gratuity) per person. The evening celebrates the richness of Italian wine culture Edoardo Montresor of Montresor and Stefano Maggini of Feudo Maccari. Six great wines (paired by wine director Jill Spoor) delicious food from Fairmont Pacific Rim executive Chef Nathan Brown. Starting the evening off is a pale pink color sparkling that is subtle and has persistent bubbles. I liked the elegant notes of ripe apples and cherries. An easy start to any evening. Grillo is a variety is native to Sicily and vinified to a fresh, light white wine with fruity notes and lemon zest. High mineral and beautiful finish. Grillo is well matched with seafood and shellfish appetizers. This sultry ruby blend of cherry, musk, spices and wood has a rich long finish. Dry on the palate with a velvety taste paired with veal. Creamy and smokey aromatic with wild cherry, spices and black olives. This lush wine finishes long and has a nice compliment to the fresh burrata and tomatoes. It would also pair wonderfully matched with full flavored meats/game. One of my favorite wines of the evening. The intense ruby red color matches the refined full body smoothness of peach blossoms, violet, raspberry and mint. This wine pairs with spicy dishes, game and seasoned cheeses. Maharis blends Mediterranean characters of balsamic notes and hints of cocoa and coffee. It is enjoyable with red meat and game because of its velvety tannins and spicy mouth feel. Watermark Beach Resort Osoyoos British Columbia is beautiful hotel right on Osoyoos Lake. The hotel is beach front and lake facing. The a beautiful sunny day, the view is quite spectacular. Too bad we came here while it was cloudy. I hope you have better luck than us. After reading the good reviews and found some pretty good deals on Bookings.com for Watermark Beach Resort Hotel. We came to Osoyoos for a Bachelorette weekend. We liked that Watermark Beach Resort is pretty central to wineries we had on our list. It is only about 15 mins to Tinhorn Creek Winery Okanagan (Miradoro restaurant is voted best of BC and the best of the Okanagan Valley) and Burrowing Owl Estate Winery. Watermark Beach Resort is also about 45 mins drive to See Ya Later Ranch Winery. Watermark Beach Resort has a nice pool with water-slides, hot tub, patio dining and also an in-house spa. We definitely took advantage of their therapeutic RMT Massage at Illumination Spa! I love a good deep tissue sports massage! The rooms are spacious and clean. Beds are firm (not soft that breaks your backs). I love the patio space overlooking the pool and lake. It makes having a beer and wine brought back from the wineries enjoyable! I’m looking forward to coming back here with Dave. It will definitely be a different experience as a couple than with the girls! If you ask what’s the number one hotel in Osoyoos? I would probably say Watermark Beach Resort Hotel. The Healing Springs Spa at Harrison Hot Springs Resort and Spa is located inside the hotel. After our long afternoon lounging in mineral hot springs pools we headed to for a couples deep tissue massage. The Healing Springs Spa is tranquil and features various services in reflexology massage, spa facials, manicures and pedicures and leisurely spa lunch. For a complete list of services available visit their website. We made an appointment for Time for Two Celebration $400 per couple. This included a romantic soak in the private Healing Springs Pool; followed by an energizing Moor Mud Treatment; a 25-minute Relaxation or Reflexology Massage; our delicious chocolate-coated fruit and a sparkling beverage. After an enjoyable massage, head back to the hot springs for another session just before dinner time nostalgia at The Copper Room. Spend an evening dancing and listening to a live band.